Record temperatures again in March. Coral bleaching at Australia’s Lizard Island on the Great Barrier Reef, in March 2016. It’s now abundantly clear: When it comes to global warming, 2016 is in a class by itself. On Tuesday, scientists at the National Oceanic and Atmospheric Administration confirmed that March 2016 was not only the warmest March in recorded climate history, it was also the most unusually warm month of any month ever measured, breaking the record set … the month prior. March was the 11th consecutive month of a new record warm global monthly temperature, the longest streak since NOAA records began in 1880—a horrendous feat that’s led to a bit of complacency in climate circles. We should not be complacent. Gavin Schmidt, director of NASA’s Goddard Institute for Space Studies, calculated that no matter how the rest of the year progresses, there’s a greater than 99 percent chance 2016 will be the warmest year on record. That he’s able to say this in April is mind-boggling. In past record-warm years, we needed to wait until October or November to make predictions with this high of confidence. Though the current planetary heat wave is likely peaking, it’s still rending entire ecosystems and plunging tens of millions of people into food shortages. On Wednesday, Australian scientists revealed a stark new summary of their comprehensive survey of the Great Barrier Reef: 93 percent of reefs there have experienced bleaching over the past several weeks—which happens when corals become overheated and expel their symbiotic algae, and can quickly lead to coral death. 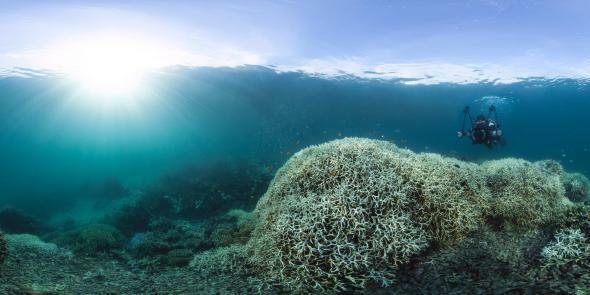 The imminent death of large parts of the Great Barrier Reef should shock the world. About 1 billion people depend on coral reefs for their livelihood. “We’ve never seen anything like this scale of bleaching before,” said Terry Hughes, who led the survey. The current global boost of heat is linked to El Niño, but experts think El Niño is taking a back seat to human greenhouse gas emissions when it comes to the reasons for the incredible hot streak. Last month’s record warmth touched all ocean basins and all continents, and, together with February—which still ranks as the most unusually warm month in NASA records—the Earth’s temperature is going through what amounts to a step change. The current warm streak is a perfect illustration of what climate scientists have long expected: There are natural oscillations (like the current warming boost from El Niño) overlaid on top of the long-term trend of global warming. The shift to La Niña, which is expected later this year, will temporarily bend global temperature back down a bit, and likely bring an end to the current streak of record-warm months. With climate change, not every year will be record warm, but it’s quite certain that even if 2017 doesn’t top 2016, there’ll be a year in the near future that will. So far, 2016 has been the warmest start to any year on record, with record warm temperatures on every continent and in every ocean basin. We’ve reached a unique moment in the history of humanity’s relationship with our home planet: No matter when the current streak ends, the relentlessness with which the global climate system has been breaking records is now unmatched by any moment since industrial civilization began, and likely long before that. New data show atmospheric carbon dioxide concentrations at Mauna Loa briefly exceeded 409 parts per million on a daily basis around April 10, the highest absolute level in millions of years—and the biggest year-to-year jump on record. Last month, an analysis by a team of British and American climate scientists showed that the current rate of increase of atmospheric carbon dioxide likely has no equal in Earth’s entire history, with current levels rising about 10 times faster than the previous fastest era of increase, about 56 million years ago. We’re locking in change that has no precedent, possibly since long before humans and countless other species first evolved. This urgency has immediate global political implications. As the Washington Post’s Chris Mooney and Brady Dennis point out, “the Earth itself has upped the stakes for the Paris climate accord,” agreed to just four months ago and set to be signed at a ceremony in New York this week. From the tropics to the Arctic, these past few months have pushed the bounds of “dangerous” change the accord was designed to prevent. An analysis released Tuesday by Climate Interactive and the Massachusetts Institute of Technology showed that even with the pledges made in Paris, the world is still on track for about 3.5 degrees Celsius of warming—and global leaders would need to agree to substantial further reductions before 2020 to meet the Paris target of keeping global warming “well below” 2 degrees Celsius. That’s a huge ask, but the stability of our climate system requires that it happens.